Pop quiz: Can you tell me one thing about new Michigan defensive coordinator Don Brown? Don't feel bad if you had trouble coming up with an answer to the question above. Given our current place in the information age, Brown's relative anonymity is a bit outside the norm for a high-profile position like the one he now holds in Ann Arbor. Compared to the hire of former NFL head coach Greg Schiano to the same position in Columbus, the hire might even seem underwhelming to some. Brown is not a former Wolverine legend. He has no NFL experience on his resume. He has no track record of developing first-round draft picks, nor is he one of the most recognizable faces on the recruiting circuit. All of these factors might lead one to question how he ended up with his new gig in the Mitten state, but the answer is simple: Don Brown is VERY good at coaching defense. The 60-year-old Massachusetts native spent the vast majority of his career coaching in the northeast, with multiple stops in the Ivy League and three head coaching stints at Plymouth State, Northeastern, before finally settling in at UMASS. After five years of leading the Minutemen, Brown decided to make the leap to the highest level of college football for the first time in 2009 when he became defensive coordinator at the University of Maryland. In the seven seasons since, Brown's defenses at Maryland, Connecticut, and Boston College have consistently improved the longer he's been at each stop. This pattern reached its apex last fall, as his BC defense was statistically the best in America, despite the fact that their counterparts on offense were the nation's third-worst such unit. In Ann Arbor, Brown faces a very different challenge than what he's seen before. While the chart above shows that his first year at a new school isn't usually overwhelming, he's taking over a defense left in a good position for the first time in his career. While the Wolverine offense went from strength to weakness during the Brady Hoke era at Michigan, the defense did just the opposite with coordinator Greg Mattison running things during that time. The maize and blue have finished with top-10 defenses each of the past two seasons, meaning Brown is taking over a unit with more talent and existing good habits than he's ever had before. By all accounts, he's not going to fix something that isn't broken, and is looking to install his philosophy while respecting what's already in place. Though, like most D-1 programs, his BC defenses were primarily zone-coverage teams, he's going to include more man-to-man coverage like his new team had run so successfully in the past. While his troops may well play a great deal of straight man-to-man coverage this fall, it's very likely we'll see quite a bit of hybrid philosophies that marry the talent Brown is inheriting with one and two-deep zone looks. For this reason, cornerback Jourdan Lewis may well be Michigan's most important defender this fall. Brown asks quite a bit from his corners, mainly because of the "sight" technique he teaches that allows them to blow up short, horizontal passes and help in the running game. When this technique is called, it's easy to see the corner cheat off his receiver with his eyes in the backfield. The cornerback is able to play off his receiver like this, thanks to the safety to his side that slides over to cover the receiver on any vertical routes, working outside-in. Lewis' true value will likely show on the opposite side of the field to this technique, as the corner on that side will be tasked with locking up the split receiver in solo coverage with no help from a safety. Some might find this philosophy to be reckless, but Brown has an established track record of drilling excellent technique into his players. With talented athletes like Lewis, Jabrill Peppers, and Dymonte Thomas to work with, that job should be even easier. What exactly he may do with those pieces is still to be seen, specifically Peppers. Though he's been practicing at "SAM" linebacker, a role similar to that of Darron Lee in Ohio State's defense the past two years, it's likely that he'll be seen all over the defensive backfield as well (as documented here by MGoBlog). With so many athletes at his disposal on the back end, Brown will be able to unleash his aggressive front when both stopping the run and rushing the passer. 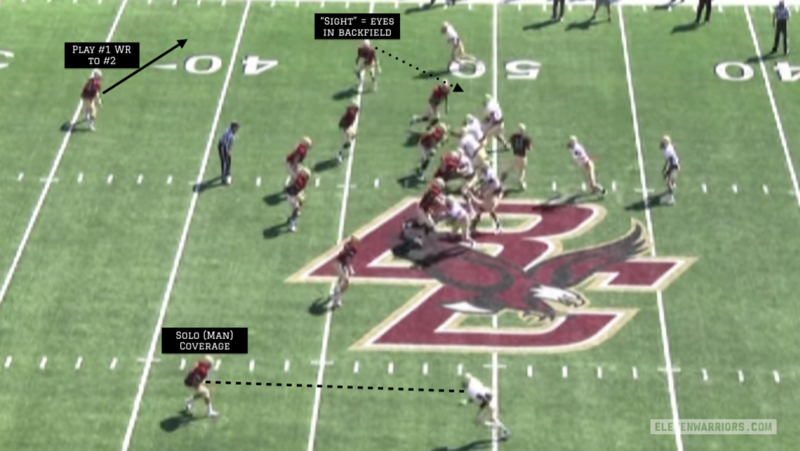 Throughout his time as a coordinator, his success has been built on his teams' abilities to stuff opposing running games, and last year's Boston College squad was no exception. The Eagles allowed only 2.39 yards-per-carry in 2015, the best mark in the nation. To do so, Brown's linebackers were tasked with playing fast, yet disciplined football. Though the group would often blitz an outside linebacker in run situations, they benefited most from playing behind an underrated and technically-sound defensive front. With the exception of Peppers, Brown's linebacking corps in Ann Arbor has given fans little to write home about over the past couple years, but this new philosophy may allow players like Ben Gedeon to be more dynamic when it comes to stopping the run. Where Brown differs most from his predecessor, D.J. Durkin, is his desire to blitz the quarterback. Durkin often favored letting his front four defensive linemen rush the pocket on their own, usually with underwhelming results. Brown, on the other hand, has shown numerous man and zone-blitz packages over the years. One of his favorites is the 'Fresno Package' (as highlighted in more detail by James Light HERE). 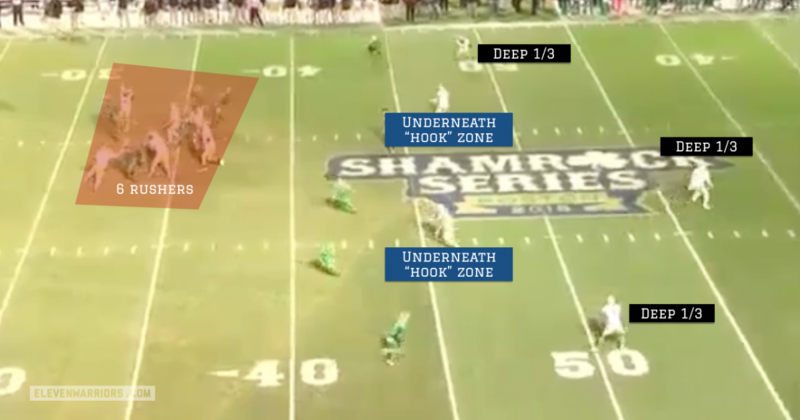 As Light points out, most college defenses employ five-man rushes in their zone blitzes, leaving six defenders (three underneath and three deep) in zone coverage behind it. Brown's package flips those numbers, adding a sixth man to the blitz and dropping only five in coverage. Unlike some teams (like Michigan State's 'Double A-gap' blitz), Brown isn't tied to one specific arrangement for his blitzers. 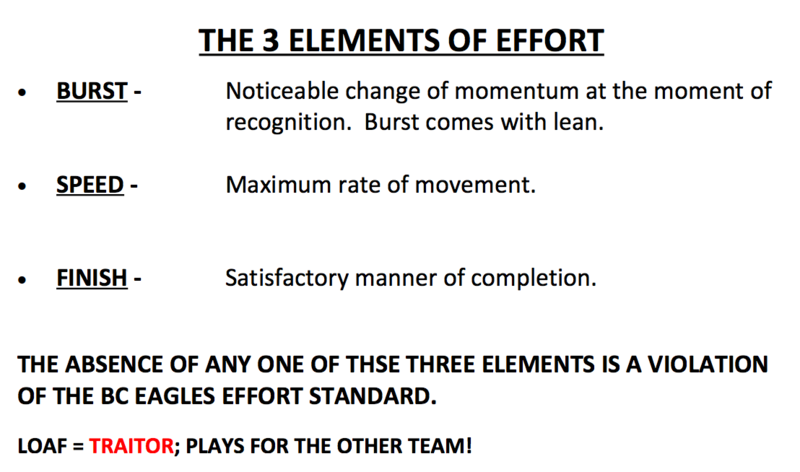 Instead, he has shown an agnostic approach to identifying who, when, and where his six rushers will come from, letting the scouting report dictate those factors and giving offenses less to prepare for in advance. Brown's method of teaching is fairly simple: "solve your problems with aggression," a phrase that shows up on the very first page of his playbook at BC. Aggression isn't just related to scheme, but rather it extends to everything his defenders do, most especially their effort. With a proven system and better talent, the pieces are in place for Brown's unit to be elite, and in a hurry. But not every situation is perfect, and if the Wolverines don't immediately live up to the hype, there could be two key reasons why. First, this is the third system being taught to these players in as many years. Though it sounds like Brown is trying to use existing vocabulary to fit his scheme, players may be quick to bail on his philosophy if it doesn't immediately show positive results. As successful as the Boston College defense was over the past two years, they were still beaten by more talented teams, such as Clemson's 532-yard, 34-point performance in October. This is a veteran group that has experienced success before, and may not be as willing to bend to Brown's ideas should they not produce immediately. Additionally, Brown has never been under the microscope he'll experience in Ann Arbor. Expectations are high for not just his team, but his unit in particular. Brown won't have the same benefit of patience from outsiders he experienced in previous stops, as the Wolverines are expected to win now. How he manages this spotlight will be as critical to his team's success as his game plans, and only time will tell how he handles it. If he's able to match his success in the former with his track record with the latter, facing the Michigan defense won't be much fun for any opponent, the Buckeyes included.